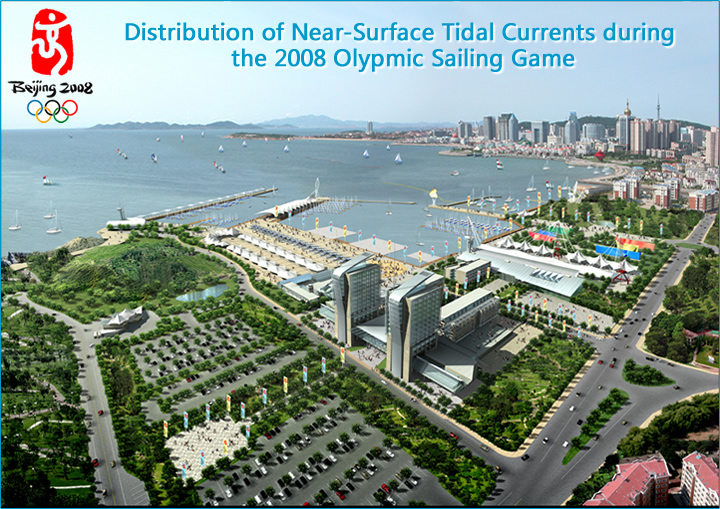 Do you want to know the spatial distribution and temporal variation of tidal currents during the 2008 Olympic game period in the sailing site in Qingdao? In a joint effort, a team of scientist from China and the United States has applied FVCOM (a state-of-the art unstructured grid Finite-Volume Coastal Ocean Model) to simulate the tidal elevation and currents in Jiaozhou Bay and the Yellow Sea focusing on the 2008 Olypmic sailing site. The model has been tested by comparing hindcast results with real ocean observations of tides and currents. Now we can provide a tidal forecast system to predict the tidal current field in the game site. The Chinese team members are Mr. Zhenhui Gao and Mr. Xing Wang at the North China Sea Environmental Monitoring Center of the State Oceanic Administration, Qingdao and Professor Maochong Shi at Ocean University of China. The US team members are Professor Changsheng Chen and Mr. Lunyu Wu at University of Massachusetts-Dartmouth. The model was configurated, run and validated by Mr.Gao, Mr. Wang and Prof. Shi. The results were checked by Mr. Wu and Prof. Chen. The tidal forecast system was built by Mr. Wu based on Mr. Wang’s results. All images and animations were produced at UMASSD. The tidal forecast results posted here are a research product. Although this system has been validated via the sea elevation recorded at tidal guages and ship-board current measurements, we still can not guarantee the accuracy of the forecast field for some unpredictable events. The user assumes the entire risk related to the use of any data and/or information on this web site. In no event will we or the University of Massachusetts be liable to you or to any third party for any direct, indirect, incidental, consequential, special or exemplary damages or lost profit resulting from any use or misuse of this data and/or information.